15 days of telephone and email assistance to be counted from the day of delivery (Monday to Friday, from 10 am to 6 pm) to deal with any queries, discuss initial experiences, etc. seven days of telephone and email assistance to be counted from the day of delivery (Monday to Friday, from 10 am to 6 pm) to deal with any queries, etc. Having delivered your nutritional programme and with the aim of enabling it to be introduced efficiently, I research the right sort of local shops within the area close to where you live or work, draw up a shopping list to match the new dietary habits you will be forming, and accompany you on your first shopping trip to make it easier for you to start out. 15 days of telephone, email and Skype-based assistance to be counted from the day of delivery (Monday to Friday, from 10 am to 6 pm) to deal with any queries, discuss initial experiences, etc. Nutritional programmes adapted to family life with children, so that the energy needs of all the members of the family are covered, with the same simple menus for everyone but with the right fine-tuned adjustments for each of them. Budgets according to the number of members of the family, ages, characteristics, conditions and nutritional needs. After having studied the profiles of the group, its needs and objectives, a budget is drawn up that has been adapted to the company or organisation, as well as a proposal of content to match the components of the group. Please contact me to arrange an interview and collect the briefing information. If you thought that lack of time, custom or culinary knowledge was going to be a hurdle in your aim to feed yourself properly, I offer a demonstration carried out directly in your kitchen of the tricks, systems and basic, essential recipes to implement your new nutritional programme successfully. Both for you and for your family or friendship group. Demonstrations of basic recipes for day-to-day living and longer-lasting themed courses, designed according to your interests or goals: energising cooking for people with no time, to strengthen the immune system, to prevent osteoporosis, to tackle gastro-intestinal health, for preparing natural puddings and snacks, to take to work, etc. Please send your request for information through the contact form, stating your availability, area where you live within the province of Madrid and I will get in touch with you as soon as possible, to design the course or workshop with you that best meets your expectations. An interesting and highly practical incentive for teams at a company or organisation is, without doubt, awareness of the effect their dietary habits have on their quality of life and general performance. Practical content inviting participation, made to measure for the company. 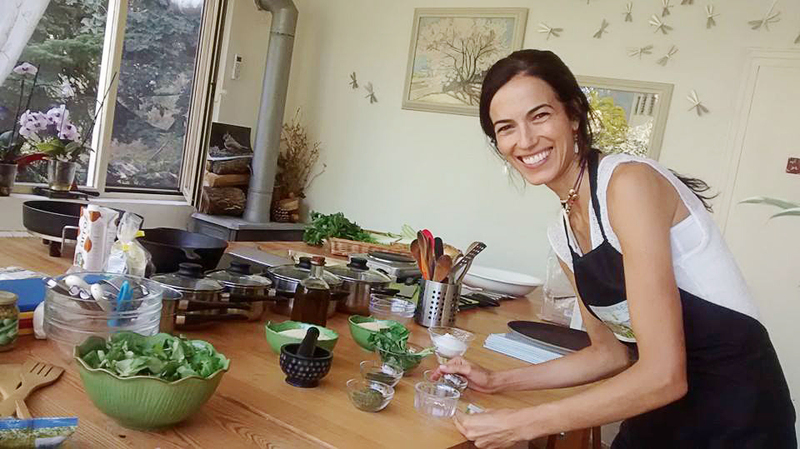 Cooking demonstrations for simple, natural, balanced, tasty and varied recipes, based on the requirements of the group. From stand-alone, themed workshops to ongoing training courses implemented over time, where participants end up tasting the dishes prepared and receive a dossier/recipe collection. Please contact me through the contact form, stating “Cooking courses for companies”, and together we will design a course that meets the expectations of your company. Something that is increasingly necessary every time in the hotel and restaurant business is nutritional knowledge about incorporating alternative ingredients for customers with food allergies and intolerances, without however giving up on the quality and attractiveness of their conventional menus. Or simply the desire has arisen to add new, very healthy options to the menu. I really enjoy it when I eat out and feel well cared for despite my allergies, especially when they offer me numerous delicious options to choose between. Therefore, I love to sit down with hotel and restaurant managers who are keen to enrich the menus they offer with balanced dishes at both nutritional and energising level, and after getting to understand their philosophy and kitchen, contributing creative and tasty content based on natural, organic ingredients that adapt to all types of customers. Any scenario is valid when there is interest in improving health through nutrition: schools, universities, business schools, companies, premises related to offering natural and organic products, etc. We seek out the themes which can awaken the most interest among the group we are going to address and I propose a relevant talk for each case. The talks can last between 30 and 60 minutes, depending on the subject and the requirements.